Sand is in a beach, like romance is in a smile. 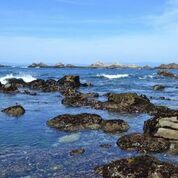 If one were to fly over northern California, from Santa Cruz to Pacific Grove, one would see the coastline of Monterey Bay donning a huge, heartening ear-to-ear smile. Not sure if this was originally part of the geographic layout, or if it developed over time from all of the smiles the area has brought to the faces that visit here. 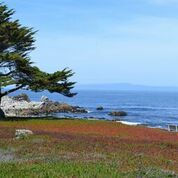 The Monterey area presents an atmosphere that delights all six senses. Jovial sea lions roar like a festival, and ocean waves crash to bring resounding echoes to the ears. Sunrise to sunset the sky becomes a canvas splashed with various colors throughout the day to delight the eyes (even the greys bring amazement). 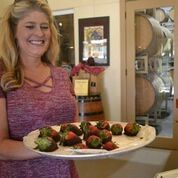 Wines from the Salinas River Valley and gourmet chefs’ culinary creations are just what those tastes buds desire. The easygoing sea breeze gently caresses, a touch only a mother could give her child. The variety of vegetation that surrounds this California coastal superstar tickles the nose. And what about the sixth sense? Well keep reading to find out how Monterey and the surrounding area are able to rouse the sixth sense. It is often called the most romantic destination in California, and for good reason. It’s blessed with a pristine shoreline combined with mellow temperatures, stylish beachfront architecture, fine dining, and some ideal spots to watch the sun sink into the ocean, followed by a splendid display of pinks and tones of tangerines and purples to set the mood for the evening. For those seeking a romantic getaway should consider getting upfront and center of this gorgeous spectacle. 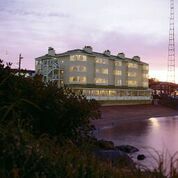 Spindrift Inn on Cannery Row snuggles up alongside the shore of Monterey Bay, with just enough sand to separate this charming European-style hotel from the gentle rolling waves. It offers ocean-view rooms, and comes equipped with classically elegant comforts such as canopy beds with feather bedding, hardwood floors, and marble bathrooms. There are even plush seats right at the windows’ edge, perfect for admiring the vast ocean or watching wildlife both in the water and in the sky. Couples might find themselves entranced as if they were set in another place and time with hints of Victorian deco and European glamour. Every morning wake up to a pleasing, complimentary breakfast delivered right to your room. 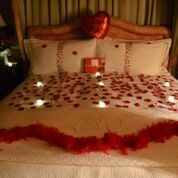 Other spoil-me services include a hosted wine hour with cheese tray every afternoon in the lobby, and fine chocolates on the pillow as part of the hotel’s daily downturn service. There is even a rooftop lounge perfect for relaxation and taking in the sights while sipping a glass of wine al fresco. Let’s not forget the hotel staff! Hospitality flows in the staff’s bloodstream, which means these folks at Spindrift Inn ensure its guests are treated with utmost attention and quality service. 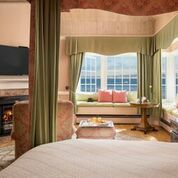 Spindrift Inn, certainly have the amenities to charm couples looking for a romantic retreat. 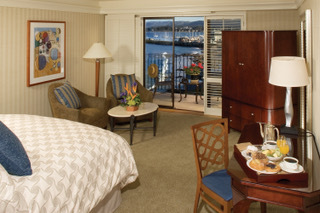 A corner ocean view room is highly recommended for sweethearts looking to add that extra spark. 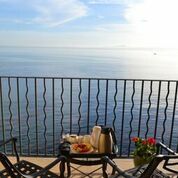 Monterey Bay Inn, a sister property to Spindrift Inn, is another great choice for lodging accommodations. Just like Spindrift, this property pulls out all the stops for comfort and relaxation, and is ideal for romantic couples looking for an escape with a stunning background. The balcony provides easy access to see the wonders below. They even provide binoculars in the room to get even closer to the wildlife or passing sailboats. 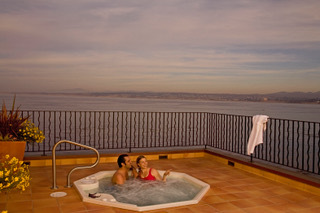 There are two community hot tubs, one that overlooks Monterey Bay. 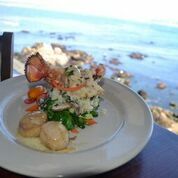 To book an overnight stay at Monterey Bay Inn visit MontereyBayInn.com or call 831-373-6242. 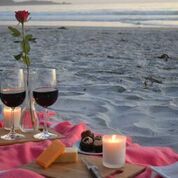 The one element that has natural tendencies to delight romance more than anything else is a beautiful sunset, and one of the best places on the planet to witness these displays of nature’s brilliance is at Carmel Beach. If Monterey is where Cupid launches his arrows; then Carmel Beach is where he hits the mark! With the legendary Pebble Beach Golf Links situated just above the sand line and miles upon miles of blue ocean that eventually transforms to dazzling pink and red; it’s no wonder why this beach has such a great reputation for being one of the best places for lovers to watch a sunset together. It’s even been said that this beach has the perfect surroundings to kneel down on one knee to pop that ever-so-important question. Carmel Beach is just a short jaunt from Cannery Row, and it’s well worth the trip to let your toes sink into the smooth, velvety sand. Bring a picnic to give it a little more romantic flare. 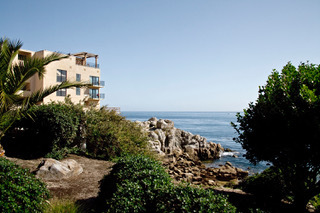 Or journey up to Carmel-by-the-Sea, which is a short walk from the beach. This quaint seaside town offers boutique shops, jewelry stores, art galleries, day spas, wine-tasting rooms, coffeehouses, eateries, bistros and fine dining establishments. 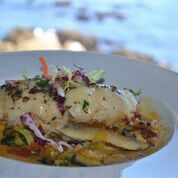 A key component that sincerely makes the Monterey region a traveler’s paradise is indeed its culinary treasures. From oysters on the half shell at the casual Flaherty’s Seafood Grill and Oyster Bar to a rare treat of locally harvested abalone at The Fish Hopper. Many of the restaurants serve organic, fresh-cut produce from nearby farms, and fishermen constantly bring in fresh-caught fish daily. But what really makes this destination even more special is its choice of exceptional wines. 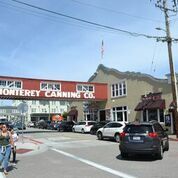 Monterey County is one of the top wine-producing regions in America. This diverse locale is blessed with ideal growing conditions, including pleasantly, warm temperatures, ancient soils that are treated like royalty, cool maritime breezes, and rolling fog that blankets the area throughout the elongated growing season. This vast area is dotted with vineyards, wineries, and tasting rooms that showcase the unique characteristics of varietals grown in the region, including some Dijon clones from Burgundy. It’s only natural that wine lovers and leisure travelers alike devote a portion of their vacation itinerary to experience Monterey’s world-class wine country. Behind the Scenes Wine Tours is an excellent choice for those who wish to wander into the vineyards for a personalized wine tasting tour. The best way to enjoy a tour of various wineries, without the hassle of driving, is to hire a designated driver that delivers not only a safe trip, but also a customized experience. Behind the Scenes Wine Tours does exactly that. 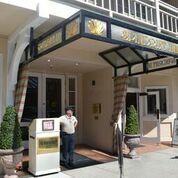 This family owned and operated outfit picks its guests up anywhere in Monterey County, and returns them safely to their accommodations after a day of sampling wines. 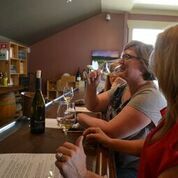 The curbside service that Behind the Scenes Wine Tours provides is indeed a special treat. However, it is proprietor Dena Franscioni’s welcoming smile that puts it over the top. Within seconds, guests will feel the warmth behind Dena’s smile and soon discover that it’s inherently in her genes to provide top-of-the-line service for her guests. In other words, Dena is not a typical tour guide; instead she is an experience provider. Dena can accommodate two to 14 guests on the tour. The company has multiple vehicles, which makes it convenient to accommodate larger groups, too. One of the best parts about the tour is the drive through the wide-open countryside of Salinas River Valley. A key factor that sets this wine tour apart from others is that its guests not only get a personalized wine tasting tour, but they also have the opportunity to meet the wineries’ owners and winemakers (hence the name Behind the Scenes Wine Tours). This is an unprecedented bonus not found anywhere else in California. Dena’s personal relationships with the vineyards and wineries gets her complete VIP access, which in turn is readily available for her guests. Learn about the science behind the growing process, and share the passion that these significant players pour into the product. Each tour includes a prepared tray of fine cheeses to enjoy with wine tastings. On weekends, Dena’s husband and business partner Bobby Franscioni, a genuine BBQ pit master and all-around good guy, delights guests at either Puma Road or Pessagno Winery with a gourmet barbeque that includes aged tri-tip, pork ribs, chicken, and homemade Zio Brand sausages. It is served with fresh-cut produce from a local farm. Bobby pulls out all the stops! His personal touch and BBQ skills bring out flavors designed to please taste buds and warm the soul. Another option to whet the appetite is at Pessagno Winery, where a stone pizza oven was recently installed to provide home-style pizzas. Behind The Scenes Wine Tours visits wineries in the San Lucia Highlands, which don similar attributes to Burgundy. 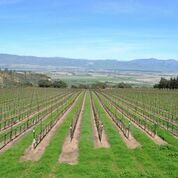 The vineyards are planted on the southeast facing knolls of the Santa Lucia mountain range, overlooking the Salinas River Valley. This region is well known for handcrafted Chardonnays and Pinot Noirs. These delicate grapes do well here because of the lenient climate that opens with morning sunshine, followed by afternoon maritime breezes to cool the vines. Combine this with a Monterey Bay marine layer that often rolls into the valley during the growing season to help nurture the vines and secure these fragile varietals. This results in a long growing season and sure enough the finished product is fabulous. 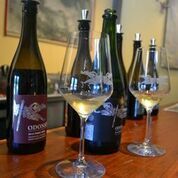 Some of the wineries included on the tour are Odonata, Puma Road, Hahn Family Wines, and Pessagno. Each of these wineries reflects an individual personality within the bottles of vino it produces. The Pinot Noirs especially abound with flavors such as cherry, raspberry, black pepper, spices, and plum. Suggested bottles for purchase are Puma Road’s Apex Vineyard and Pessagno’s ‘Four Boys’ Pinot Noir. The Chardonnays produced in this region bring in light flavors such as citrus, honey, pineapple, vanilla and peach. Suggested bottle for purchase is Hahn Family Wines’ SLH Chardonnay. For those looking for a more exotic white wine should try Odonata’s River Skimmer. This Viognier brings tones of citrus with hints of passion fruit and other tropical delights. Behind the Scenes Wine Tours are available daily all year round, with special tours throughout the holiday season and winter. There are a variety of different tours to choose from that range from four to six hours long. Prices start at $85 and up. For more information visit BehindTheScenesWineTours.com or contact Dena directly at 831-596-4495 or email dena6445@yahoo.com. Culinary choices abound in the Monterey region, where great wines are teamed with the freshest ingredients to deliver the perfect pairing. There are numerous ways to explore the gastronomy of this region with a wide assortment of cuisines delivered by top-ranked chefs. There are many superb choices to eat out such as The Sardine Factory in Monterey, Dametra Café in Carmel, Passionfish in Pacific Grove or The Sur House in Big Sur. Restaurants are certain to please the palate in so many ways from cooked-to-perfection entrees to heartwarming desserts. 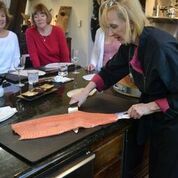 For those who want to take this region’s culinary experience to new heights however, should hook up with Executive Chef Wendy Brodie who conducts personalized cooking classes in her home. Chef Brodie is well known for her local weekly television show “Art of Food,” where she shows viewers the ins and outs of gourmet cooking. Art of Food Catering and Cooking Classes gives guests an opportunity for a personal experience in the kitchen with this celebrated chef. Speaking of kitchen. Chef Brodie’s home was literally built around the kitchen, which is a good indicator that this executive chef is immersed in passion for the culinary arts. Brodie’s kitchen comes equipped with a commercial walk-in refrigerator, state-of-the-art appliances, and classy granite countertops. However, it’s not necessarily the tangibles that make up this awesome kitchen, but rather it’s Chef Brodie’s burning desire to share her knowledge and love for cookery in her Art of Food Catering and Cooking Classes. Brodie holds an impressive resume from executive chef positions at prestigious world-class resorts in Carmel Valley to Guest Chef at five-star hotels in Europe and the Jockey Club in Hong Kong. This celebrated California artist/chef is known for her creative style with food presentation and table décor, and is often described as an artist whose medium is food. So no matter what the guest’s skill level is, Chef Brodie is certain to teach a new trick or two to hone that skill level in her cooking class. The cooking classes are built around what the guest wants to learn, combined with the chef suggestions to best suit a customized experience that fits within the individual’s interest and budget. She says a recipe should not tether her students. Instead they should soak up the overall experience. 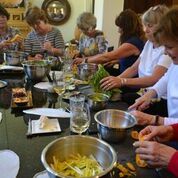 Cooking classes are tailored for beginners to professionals for groups of six or more. 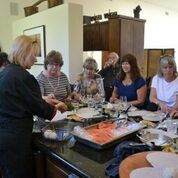 Once the cooking class is scheduled, Chef Brodie will do all of the legwork to ensure she delivers a first-class experience for her guests. This includes shopping at five to eight different culinary shops and farmer’s markets to hand select locally grown items. She even has her own garden in the backyard where she often selects certain herbs or veggies to suffice the upcoming menu. One thing for certain is Chef Brodie is ready and willing to show various tips and tricks of the kitchen. In fact, she shares so many culinary tidbits and techniques, that the info seems virtually endless. Throw any question at her, and she is quick to answer in a professional manner. Chef Brodie never misses a beat when answering a question, and her answers are invaluable. Her main objective is to create a fun experience for all, and she thrives on teaching, but says she always learns something new from her guests as well. She calls it a win-win for both parties. Guests have the opportunity to learn the ins and outs of handcrafting creative main dishes, hors d’oeuvres, dressings, sauces, and desserts. They will also learn some inventive food presentations. One of Chef Brodie’s favorite parts of the class is when everyone in the party gets to become their very own “salad artist,” which gives each individual and opportunity to show his or her artistic touch. Chef Brodie and husband Bob Bussinger (a certified hotel administrator) go beyond the realms of hospitality. Their cooking classes are like going into a friend’s home for a house party with all the fixings. It’s as if you’ve known this lovely couple all your life. To schedule one of the most unique culinary experiences in Monterey County call Executive Chef Wendy Brodie directly at 831-626-9000 or visit WendyBrodie.com. 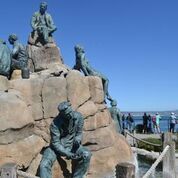 For all there is to see and do in the Monterey region visit SeeMonterey.com. 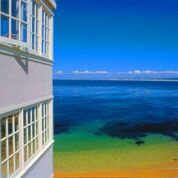 For lodging options be sure to visit InnsofMonterey.com.